I must say that when you train your dog with toothbrushing when he is still a little puppy it wil go more easy then with a grownup, who is not used to such business. So I try to do that every other day, but at least twice a week. On mondays I go over all the dogs, check their coat, nails etc, and if there is any plaque I will remove it with a scraper. Here is also a little note, do not scrape below the age of 2 years, you could damage the coating of the teeth. And every now and then I give them a dental care snack. 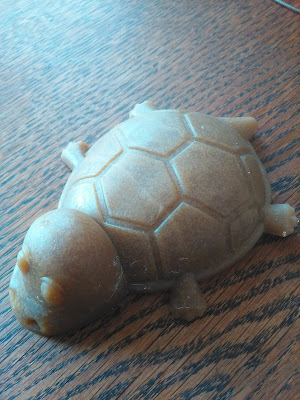 A few weeks ago I got 1 Dental D'light turtle made by Antos, as a present for entering a dogshow. So I decided Anna should get it, because it looked like it would be to big for the collies. I once tried different things of different brands, but this one was very tastefull, or I think so, because Anna was finished with it very soon. 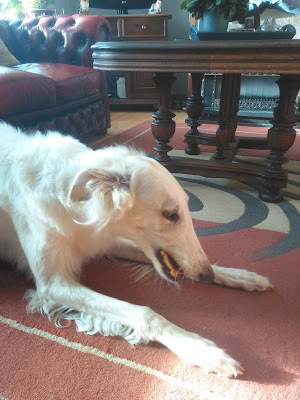 But I don't know it if really worked, because she was finished with it soo soon, but maybe it was ok for her gums, and she got a lovely treat. I checked on the internet, and found there where different sizes, so afterwards this turlte was maybe more suitable for the collies then for the big borzoi mouth. Maybe I will go out and buy more of them, just to see how thing work.